Fire blight is a common and very destructive bacterial disease of apples and pears (Figure 1). The disease is caused by the bacterium Erwinia amylovora, which can infect and cause severe damage to many plants in the rose (Rosaceae) family (Table 1). On apples and pears, the disease can kill blossoms, fruit, shoots, twigs, branches and entire trees. While young trees can be killed in a single season, older trees can survive several years, even with continuous dieback. Figure 1. Fire blight damage on an apple tree. Fire blight first appears in the spring when temperatures get above 65 degrees F. Rain, heavy dews and high humidity favor infection. Precise environmental conditions are needed for infection to occur and as a result disease incidence varies considerably from year to year. Fire blight bacteria overwinter as cankers in living tissue on the trunk and main branches and on mummified fruit. 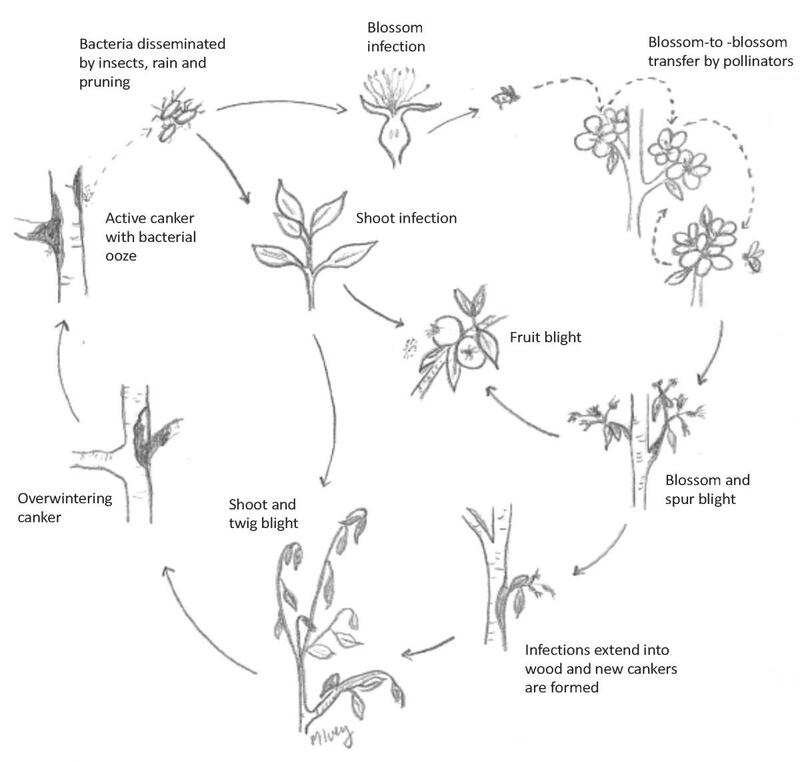 Primary infections (Figure 2) are initiated during bloom when bacteria are carried from the cankers to open flowers by splashing rain, pollinating insects (i.e., bees, pollen wasps, flies, ants) or during production practices such as pruning. 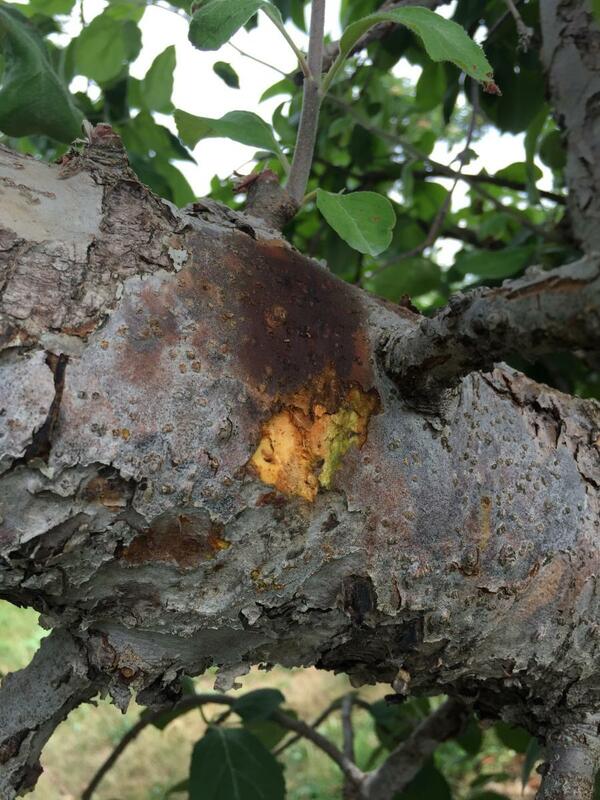 Relatively few overwintering cankers become active and produce bacteria in the spring, but a single active canker may produce millions of bacteria, enough to infect an entire orchard. These bacteria multiply rapidly in the blossom nectar, and spread to the spurs (blossom-bearing twigs), new shoots and branches, resulting in secondary infections. Shoot infections can also occur through wounds created by sucking insects (aphids, leafhoppers or tarnished plant bugs), freeze or frost damage, wind whipping, wind-driven rain, or hail. Once a shoot is infected, the fire blight bacteria multiply rapidly and droplets of ooze can be seen within three days. Shoots remain highly susceptible to infection until vegetative growth ceases and the terminal bud is formed. Figure 2. Fire blight disease cycle. Figure 3. Fire blight on apple blossoms and spurs. 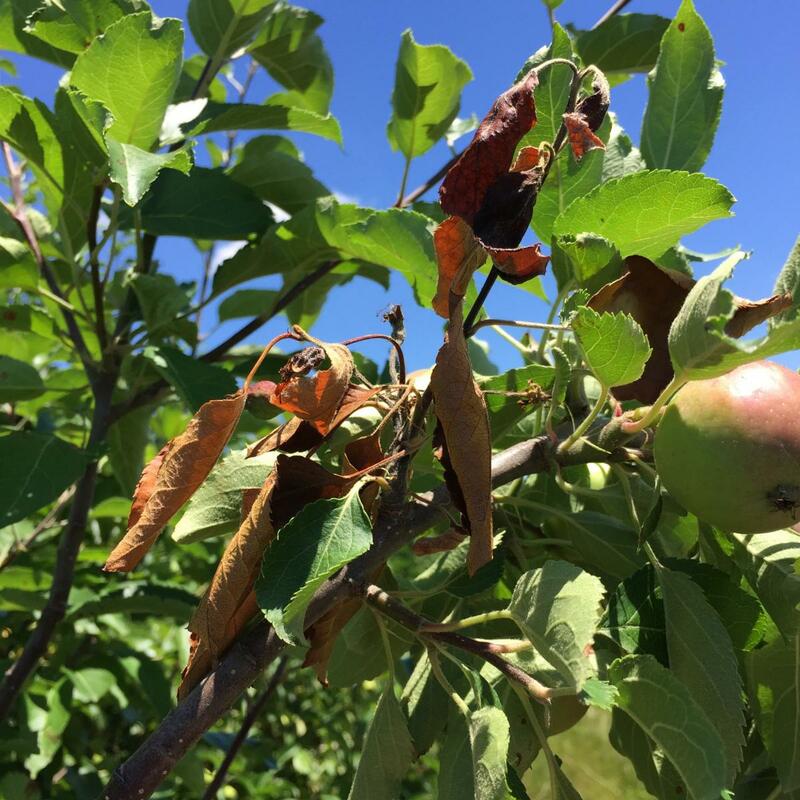 Fire blight symptoms vary depending on the tissue affected and can also vary between pear and apple. Blossom and spur symptoms appear in the spring. Bacteria gain entry into the tree via blossoms and new shoots. Diseased blossoms become water-soaked, wilt and turn brown. Bacteria spread rapidly into other flowers in the cluster and then move down into the spur. Spurs become blighted, turning brown on apples and black on pear (Figure 3). Shoot blight starts at the growing tips of shoots and moves rapidly down into older portions of the twig. Blighted twigs first appear water-soaked, then turn dark brown or black. As blighted shoots wilt, the twigs bend at the growing point and resemble a shepherd’s crook or an upside down “J” (Figure 4). Blighted leaves remain attached to the dead branches throughout the summer. During warm and humid weather infected shoots will ooze droplets of creamy white bacteria. Figure 4. Fire blight on an apple twig. Note the curved “shepherd’s crook” at the tip of the diseased twigs. Image courtesy of Marcus McCartney, OSU Extension, Washington County. 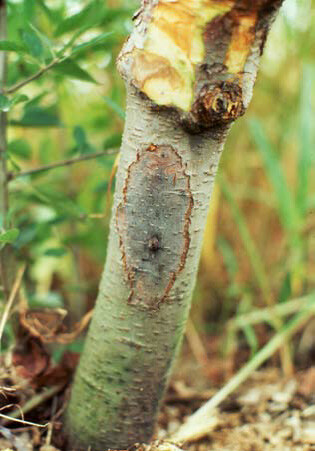 As fire blight bacteria move through blighted twigs into the main branches, the bark sometimes cracks along the margin of the infected area causing a distinct canker (Figure 5). Bark on younger trees becomes water soaked and the cankers have a dark brown to purple color. Sapwood beneath a canker has a reddish brown appearance (Figure 5) and may be soft to the touch. Cankers can girdle the main branches and trunk causing additional dieback. Both apple and pear fruit may be blighted. Rotted areas turn brown to black and become covered with droplets of whitish tan colored bacterial ooze. Fruit remain firm and eventually dry out and shrivel into mummies. Fire blight symptoms on rootstocks usually develop near the graft union. Symptoms are similar to those of stem cankers. 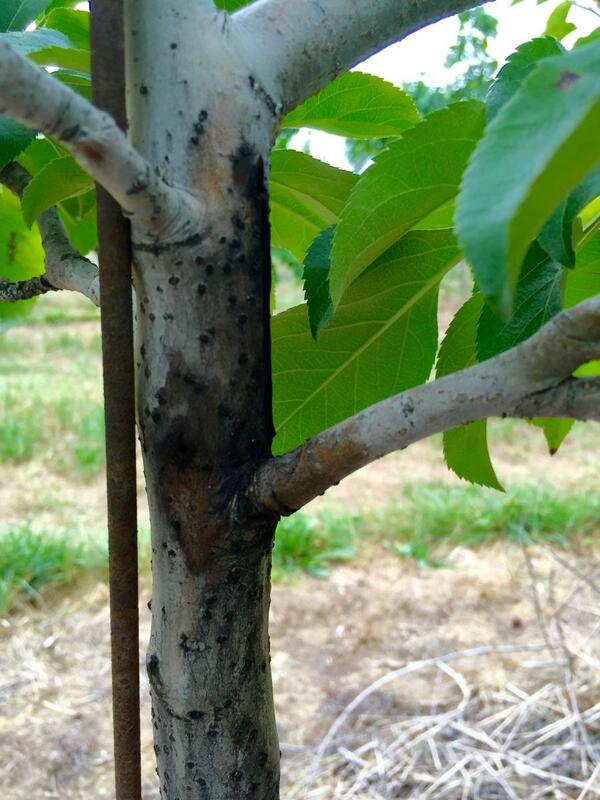 Fire blight infections in rootstocks can rapidly kill the tree by girdling the rootstock. Fire blight is one of the most difficult diseases of apple and pear to manage, and no one procedure will give complete control. Though management is not an easy task, the use of several practices in an integrated manner should result in minimal damage and losses from fire blight. Figure 5. Fire blight cankers on young apple tree trunks (top) and mature tree branch (left). Note the reddish brown appearance of the sapwood beneath the canker on the mature tree branch. 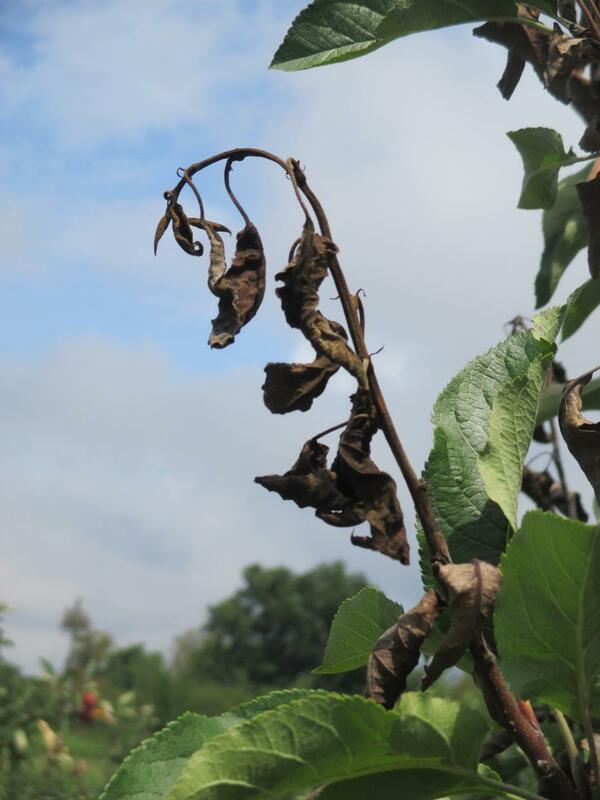 Commercial growers should consider following a recommended chemical spray program for fire blight. Chemical sprays for fire blight control are generally not recommended for backyard growers. Instead, backyard growers are encouraged to plant less susceptible varieties and use other nonchemical control measures, some of which are described below. For the most current spray recommendations, commercial growers are referred to the Midwest Fruit Pest Management Guide. Backyard growers are referred to Bulletin 780, Controlling Diseases and Insects in Home Fruit Plantings, which is available from your county Extension office or the CFAES Publications online bookstore at estore.osu-extension.org. Select and plant resistant varieties. Planting highly susceptible varieties makes fire blight management extremely difficult. When establishing an orchard, select and plant apple and pear rootstocks (Table 2) and varieties (Table 3) that are less susceptible to fire blight. Prune out fire blight cankers and blighted twigs. 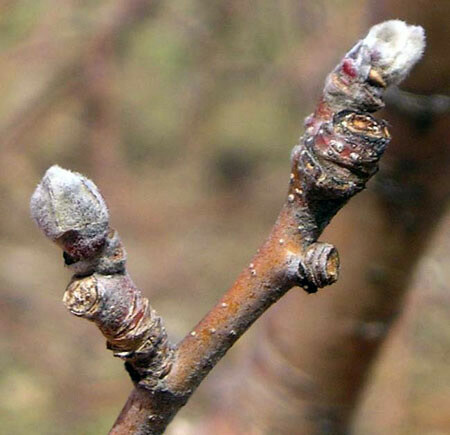 Dormant season (winter) pruning of blighted twigs and cankers removes fire blight bacteria from the orchard so that the bacteria will not be there to start new infections in the spring. Even in orchards without a known history of fire blight, it is important to look for blighted twigs and cankers and remove them. To remove blighted twigs, make a clean cut into healthy tissue that is at least 4 inches below visibly dead wood. Cankers can be cut out of trunks or large branches by removing dead tissue until healthy tissue is observed. Infected plant tissue should be taken out of the orchard and burned or placed into the trash. *Although Bud.9 and M.9 are susceptible to fire blight, observations in Ohio indicate that Bud.9 is less susceptible to rootstock infection by fire blight bacteria than M.9. Minimize summer pruning of blighted shoots. Summer pruning of blighted shoots can slow the movement of bacteria in the orchard if done carefully and correctly. However, if proper sanitation practices are not used, bacteria can be inadvertently spread to healthy tissue and exacerbate the disease. Pruning of blighted shoots should only be done in dry weather, cuts should only be made into healthy tissue that is at least 12 to 15 inches below diseased wood, and pruning tools must be sanitized after each cut. Tools can be sanitized by dipping them into a 10 percent bleach solution (1 volume of bleach to 9 volumes of water) containing a few drops of liquid soap. A new bleach solution should be prepared when the solution appears dirty. Infected plant tissue should be taken out of the orchard and burned or placed into the trash. Follow proper pruning and fertilization practices. Excessive nitrogen fertilizer and heavy pruning will promote vigorous growth of succulent tissue, which is very susceptible to fire blight. Make fertilizer applications in early spring or late fall after growth has ceased. Never conduct routine pruning (i.e., pruning to stimulate growth or shape the tree) at the same time as pruning to remove blighted twigs, shoots or cankers. Make an early season application of copper. Trees with a history of fire blight should be sprayed with a copper-based pesticide to reduce the build-up of bacteria on buds and bark. Copper should be applied at silver tip (when buds are just beginning to swell) to green tip and no later than half-inch green (Figure 6). Spray streptomycin at bloom. Streptomycin is an antibiotic that can kill fire blight bacteria before they enter the apple tree. The nectaries of the flowers are where bacteria enter apple trees, so it is critical that streptomycin is applied while the flowers are open. For this reason, streptomycin may need to be applied multiple times until petal fall. Streptomycin can also be applied as a rescue treatment following a severe weather event such as hail, wind-driven rain or high winds. Figure 6. 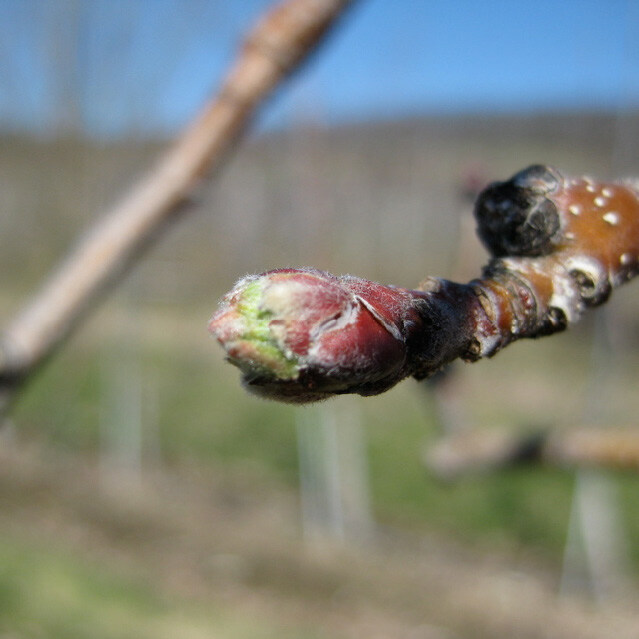 Apple buds at the silver tip (left) and early green tip stage (right). Images courtesy of Mark Longstroth, Michigan State University Extension and Dave Schmitt, Rutgers Cooperative Extension. The biological control product Serenade Garden Defense, which contains beneficial antibiotic-producing bacteria (Bacillus subtilis), can be used by backyard gardeners in place of streptomycin. Like streptomycin, Serenade Garden Defense should be applied to open flowers through bloom. Apply the plant growth regulator Apogee. Apogee (prohexadione-calcium) is a growth inhibitor that can reduce shoot blight when applied preventatively at 1 to 3 inches of new shoot growth. Apogee will not control blossom or spur blight. Orchards with a history of fire blight or planted with fire blight susceptible varieties or rootstocks will benefit the most from an Apogee treatment. 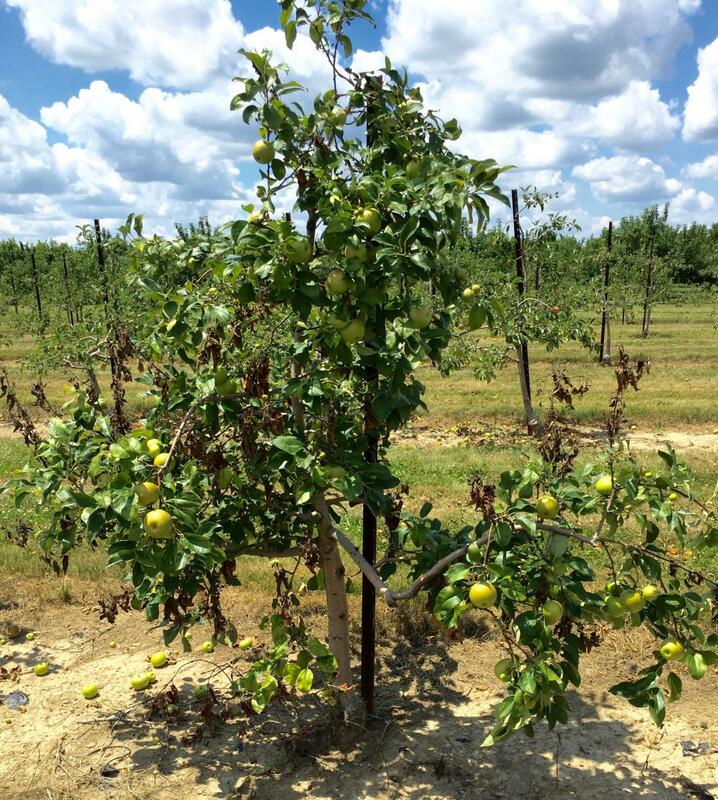 Commercial growers should contact their county Extension educator or fruit tree specialist for guidance on determining if Apogee should be applied in their orchard. Apogee is not recommended for backyard growers. Control sucking insects. Sucking insects create wounds through which fire blight bacteria can enter. These pests should be controlled throughout the growing season. To protect bees, do not apply insecticides during bloom.